Known as The Tiger from the West. Once Northerly learned to fight in his races it didn’t take long for people to realise there was something special about this fellow. Aside from Old Comrade sliping past him in a Australian Cup very few can vouch for the same conquest. Trained by Fred Kersley, for seasons Northerly would line-up in both Autumn and Spring campaigns and demoralize pretty much everything that stood in between him and victory. As mentioned Northerly had a freakish trait of once finding the lead no matter at what stage in the race he rarely gave it up. Along the way he won everything important from Futurity Stks up to Caulfield Cups, with a pair of Cox Plate’s in between and 4 other group ones. Northerly truly was a modern day champion. 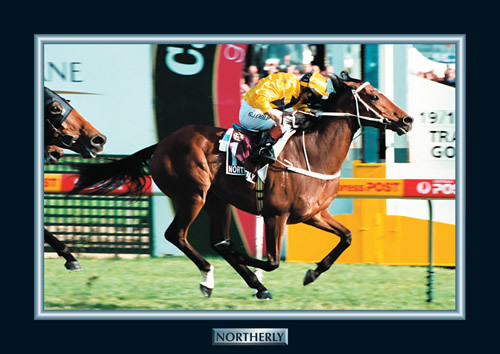 Northerly's racing highlights were compelling winning back to back Cox Plate's in 2001 & 2002, two Australian Cups in 2001 & 2003 along with his gallant leading all the way effort to win the 2002 Caulfield Cup.